With block occupancy detection running on the test loop, it was time to start experimenting with signals. 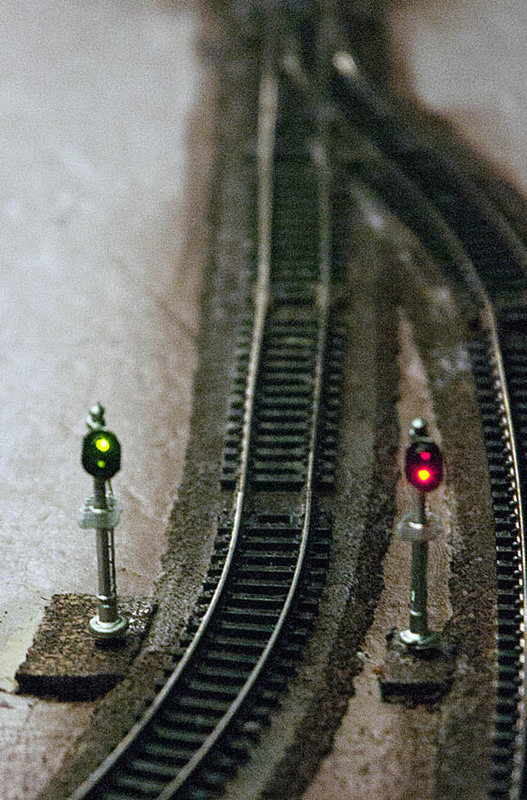 Automated signaling is an important part of the plan for the L&NC. 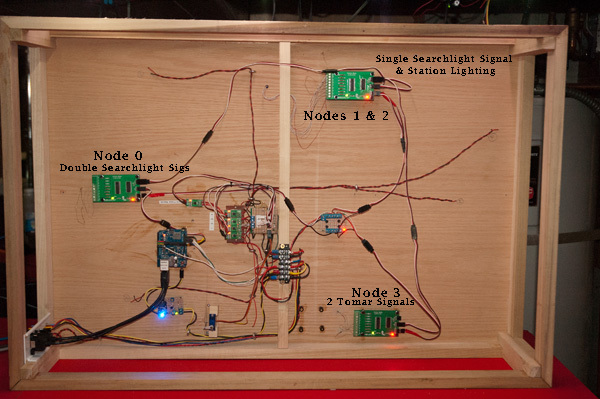 Signaling potentially involves a great deal of wiring. It isn’t particularly difficult when done the Arduino way, but it does force you to deal with common capacity issues that come into play whenever you want to control a lot of lights or other kinds of devices. I think of signals as the simplest form of animation a layout can and should have. Creating a signaling system is a good starting point for developing more complex automation and animation for the layout. 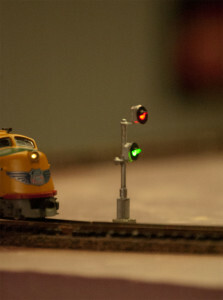 Initially, I bought a couple of Tomar Industries n scale signals to try out something off-the-shelf. These particular ones are nicely made and fully wired with red and green LEDS. A three aspect (red, yellow, green) version is also available. With two outputs required to power each signal, it became clear that directly powering an entire signal system from a microcontroller would be impractical because there aren’t enough pins to work with. Further, The Tomar signals turned out be wired in the common anode configuration, which had additional implications. Common anode wiring is not unusual in off-the-shelf accessories. Arduino boards have design limitations when it comes to powering and controlling external devices. The amount of current an Arduino can source or sink on any one pin is limited to 40 mA, enough to light a couple of LEDS. The ground pins can sink a maximum of 400 mA. Accordingly, an UNO could power a maximum of 10 pins with no more than two 20 mA LEDS on each. The I/O pins cannot handle enough current to run most solenoids, relays or motors. Common anode devices present further problems because Arduinos are common ground devices. Even through the IO pins can sink current, you can’t switch them into a ground state the way you can switch them into a high voltage state. Most of us are used to common ground — or common cathode — wiring style to control multiple lights or other electronic objects with a minimum number of wires. 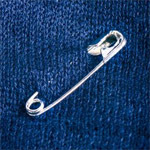 There, the positive feeds are isolated from each other so individual devices can be controlled, but they all connect to a common ground. Common anode wiring is the reverse, where multiple devices share a power feed, but their ground sides are isolated from each other for control. Where resistors are needed to control current, as with LEDS, they are put on the cathode side instead of the anode side. Running signals and other animation to any significant extent requires a strategy to multiply the outputs an Arduino can control in a way that is broadly compatible with available devices. Fortunately, there are readily available components that can significantly extend the I/O and current handling capabilities of an Arduino Board and allow control of common anode devices. HC595 Shift Registers (I use the 74HC595 variant) are logic ICs offering a basic way to multiply the digital output pins the Arduino can control. 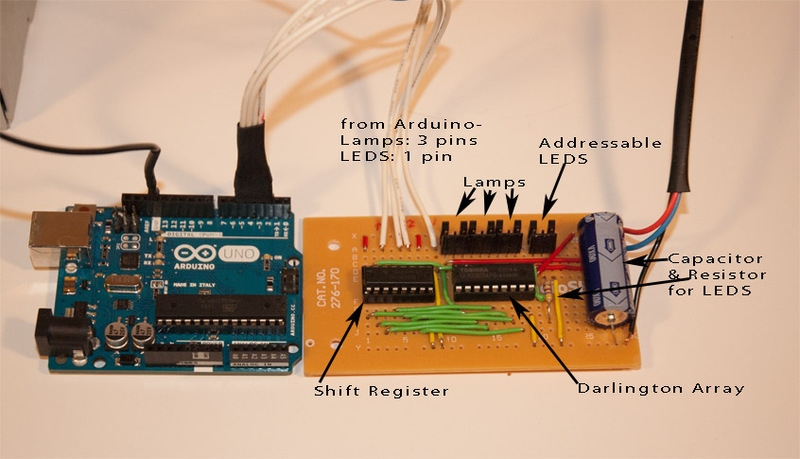 Using just three digital pins, an Arduino can control 8 output pins on the shift register. Better still multiple shift registers can be serially connected, without any additional connections to the microcontroller, to extend the number of outputs under control to span many shift registers. I’ve previously written about shift registers in the Roundhouse rebuild. To control a shift register, a byte of memory is needed to represent and manage the state of the register’s 8 pins. Accordingly, the maximum number of outputs you can control in a single chain of shift registers is primarily limited by the amount of memory available for managing them. Consider, though, that a 100 bytes of memory allows you to control 800 digital outputs using just three Arduino pins. Let that sink in for a minute. Shift registers are serial input, parallel output devices; the Arduino writes the bits serially, then all connected registers output on all data pins at the same time when the write is finished. Shift register outputs maintain their state–on or off–indefinitely until changed. Another basic tool is a ULN2803APG Darlington Driver, an IC that can switch higher voltages and higher current than an Arduino or shift register can handle. These are current sinking transistor devices, using NPN Darlington pairs; the addition of internal clamping diodes allow them to handle inductive loads such as relays, solenoids and motor driver applications like running unipolar stepper motors. LEDS and incandescent lights work well in common anode configuration controlled through a darlington driver. Darlingtons allow a logic system (the microcontroller and attached Shift Registers) to control a set of outputs that are powered independently. So, for example, a 5 volt logic system can switch a 12 volt load (up to 50 volt max). Very useful, yes? For current up to 500 mA per channel, Darlington Drivers can be a viable alternative to expensive relays. An HC595 Shift Register plus a Darlington Driver extends the number of digital outputs a single Arduino board can control, using a common anode wiring solution that can handle virtually any kind of layout animation or control device. Using using Shift Register/Darlington Driver pairs and going to common anode wiring as my standard makes all connection and access methods uniform across a variety of devices. In theory, you just connect the output of the shift register to the corresponding inputs of the darlington driver, connect the darlington outputs to your devices, and you are good to go. Trouble is, the chip designers didn’t get the memo on that! 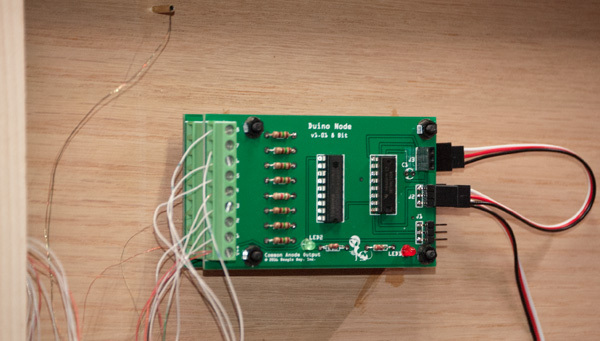 The chips are a little difficult to interconnect: you can’t place the chips side by side and have respective outputs and inputs facing each other in the correct order. In fact, the HC595 connections are arranged a little oddly, requiring at least some connections between it and the darlington to cross over each other no matter what. My first try was the roundhouse controller board. My problem then was trying to run some low voltage incandescent bulbs from 3.3 volt power. The darlington driver allowed me to do that with the 5 volt shift register. See all those green jumper wires? That was my first solution to the interconnect problem on a single layer board; it works but it is awkward, bulky and hard to replicate. The additional interface for the addressable LEDS further complicates the board. For signals on the test loop, I decided to try to shrink the board size, incorporate the necessary resistors (they are on a separate board in the roundhouse) and take a two sided approach using my favorite two sided prototyping boards. As I was planning to record the block occupancy demo, I decided I needed more signals on the test loop to show the block occupancy system in action. 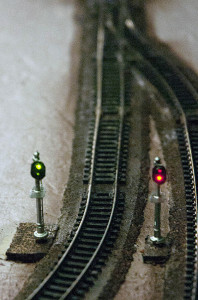 I still had four available outputs on the board running the two Tomar signals– except those could not help me with a signal on the other side of the layout [the signals all have short lengths of thin magnet wire]. 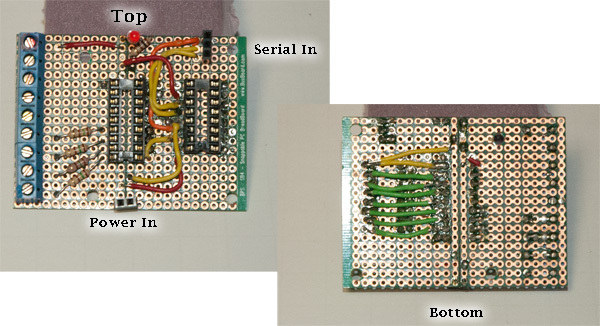 The HC595 can connect to another shift register serially, but I had not provisioned that on the boards built so far. It takes three connections to link to the next shift register: the two shared timing lines and the data output from the shift register. Time to build board #3. The board works fine. 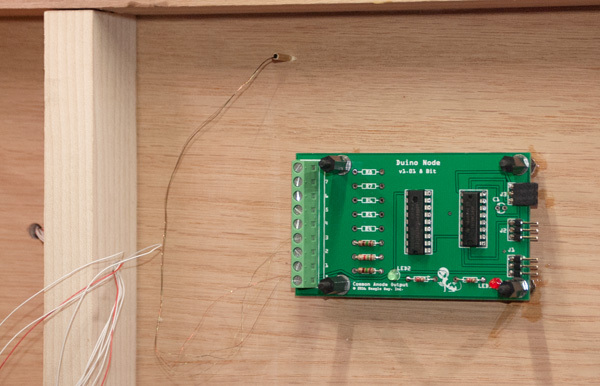 But creating these boards with prototyping materials is painful because of the number of jumpers to route and connections to make. As useful as these were going to be, it was going to take a long time to churn out a lot of them accurately. 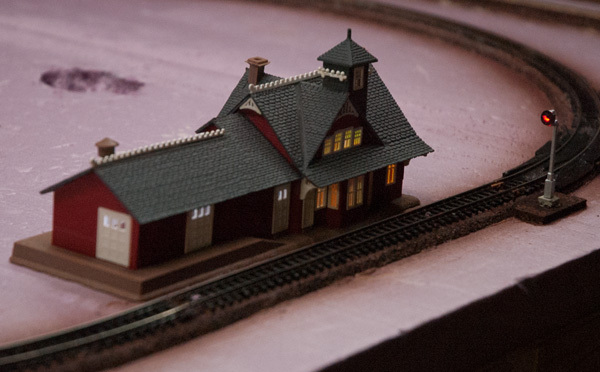 On the L&NC I expect to be controlling hundreds of lights and other devices around the layout. There had to be a better way. I was using fritzing, my favorite circuit design tool, to work on the circuit design for the next board and it became obvious that what I really needed to do was have a printed circuit board produced to my specs. Since I would need several boards for the test loop alone, and I was only just getting going, a small trial run of boards made sense. I’m glad I did. 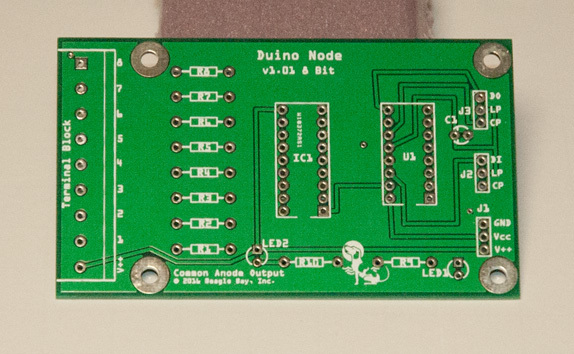 Here is the first version of what I call a Type A Duino Node. These are double sided pc boards, pre-drilled and ready for components, with copper ground fill on both sides for emf control. It takes about 10 minutes to assemble a board for use. The prototypes took over an hour each to build, so the practical time savings for the dozens I’ll need on the L&NC is substantial. They are 88 mm x 52mm; about 30% bigger than the smallest prototype I built. There are a couple of reasons for that: first, the board has Arduino-style mounting holes arranged to facilitate board stacking. Second, since these boards will run lights and other devices with varying current limits. generous space is available to mount an appropriate resistor for each cathode. A jumper can be used if a resistor is not needed, as might be the case when running a relay, motor or solenoid through a position. On the right side are three control connectors: power, serial in and and serial out. When stacked, only short three wire jumpers are needed to chain from one board to the next. A terminal block is mounted on the opposite, output side of the board. There are nine positions: the common anode (power) plus eight switchable cathodes. There are four boards deployed on the test loop. One is dedicated to the two Tomar signals above. Another board runs the dual signals below. The top searchlight is three aspect (red, yellow, green) and the bottom is two aspect (red, green), requiring a total of 5 outputs. The last two Duino Nodes are used together for the station / signal complex. The signal is three aspect (red, green, yellow). The station has a total of 8 individually switchable LEDS for internal lighting. You may notice that the two sections of the depot have distinctly different lighting: the passenger station side has warmer, incandescent lighting (achieved with a mix of led colors); and the freight side has a cooler fluorescent lighting style (cool white LEDS). One node is for the station signal that connects via four strands of magnet wire. The second node mounts on top of the first, and it controls the Station internal lighting. The bottom node receives the incoming serial connection from elsewhere; then a cable connects the bottom serial out with the top serial in. There is no limit to the number of boards that can be chained and/or stacked together. The Duino node for station lighting is stacked on top another node that runs the signal. Here is a view of the test loop from below with all the Duino nodes in place. 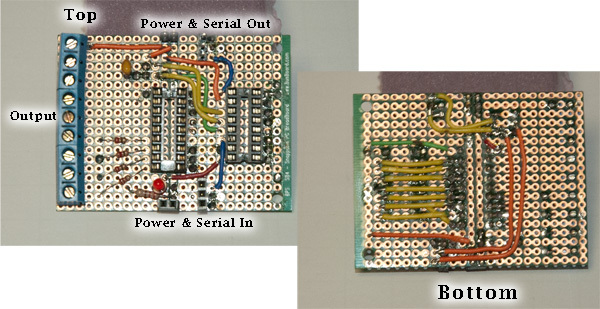 It may be hard to tell, but the overall effect of using the Duino nodes is to simplify and compartmentalize wiring. The real advantage of this system comes from adopting a uniform addressing system that makes it easy to randomly access and change any element on any node at any time. I’ll go into that in the next post. This entry was posted in Electronics, Layout Control, Lighting and Animation, Test Loop and tagged Arduino, Circuit Design, Darlington Array, Layout Wiring, Shift Register, Signals.